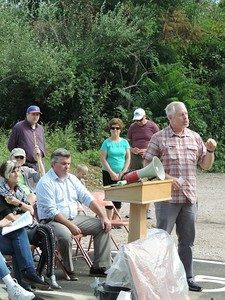 On Saturday, September 23, Shoreline Greenway Trail and the Town of Branford hosted a celebration of the completion of Branford’s new Tabor trail section. We had a beautiful day for it! More than fifty well-wishers gathered and listened to Congresswoman Rosa DeLauro, Branford First Selectman Jamie Cosgrove and REI manager Neil Johnson outline the many benefits of the Shoreline Greenway Trail in general and this section in particular for both commuting and recreational biking and walking. DeLauro recalled her role in obtaining the federal grant, which provided the majority of the funding. 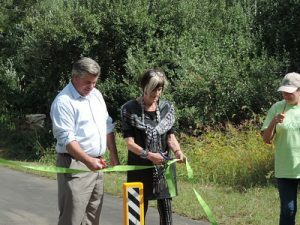 Cosgrove emphasized that since the trail is almost flat, it is also wheelchair accessible. Johnson explained that REI’s grant for safety features such as bollards and stop signs for the trail is based on their philosophy of working with towns to improve outdoor recreation. 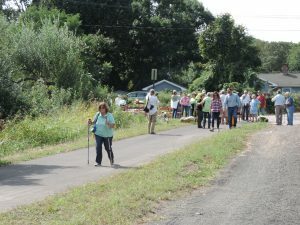 SGT Chair Judy Miller pointed out the trail’s location in an environmentally friendly hub, with Ecology Park, the Branford Trail, and Branford’s new solar array nearby. She thanked four men who were pioneers in developing the trail in Branford from the very beginning: Chet Blomquist, Art Johnson, Pete Peterson, and Jack Wood. Chet will be honored with a sign beside Chet’s Pond, officially named after him in 2011. 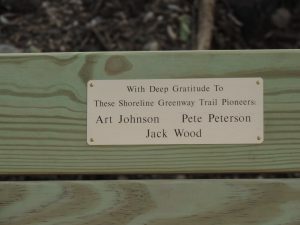 Art, Pete, and Jack are honored with a bench beside the pond. After the ceremony, the new trail was filled with walkers young and old, strollers, dog walkers, and bicyclists, all enjoying the new trail. SGT hopes that more celebrations will follow as safer biking and walking are developed in our towns.